Simon & Schuster/Paula Wiseman Books, 9781442473928, 40pp. Quack, quack—woof? A quick-thinking duck keeps a fox on his toes in this witty romp from a New Yorker cartoonist. One dark night in the henhouse, a hungry fox in search of his dinner gets more than he bargains for. Instead of a chicken, Fox grabs a duck. A very smart duck. A duck so sly, he plans to convince Fox that he isn’t a duck but a—dog! Yes, a dog. This clever story and its accompanying visual narrative will delight readers young and old—because if it looks like a duck, and it quacks like a duck, it HAS to be a duck…right? Mike Twohy has been drawing cartoons as far back as he can remember. The author and illustrator of Poindexter Makes a Friend, Outfoxed, and Wake Up, Rupert!, he received his MFA in painting in 1973 from the University of California, Berkeley. In 1980 his first drawing was published in The New Yorker, which has published his cartoons regularly ever since. 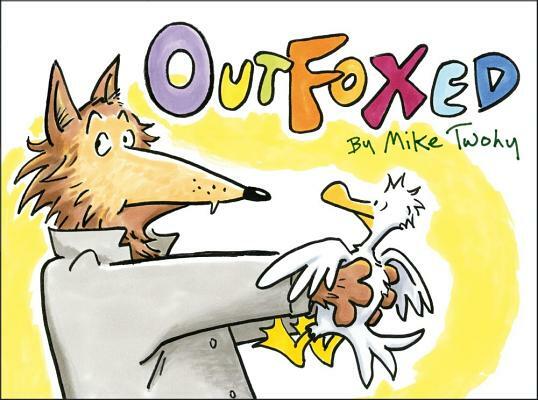 He has written and illustrated several books for children, including Outfoxed, about which the Horn Book said “storytime audiences will howl with laughter.” He lives with his wife, cat, and Newfoundland in Berkeley, California. K-Gr 2–If it looks like a duck, and quacks like a duck…but wait, this white-feathered yellow-billed bird is barking like a dog, slobbering like a dog, chewing up socks like a dog. What gives? That’s what Fox wants to know after he inadvertently grabs a duck out of the henhouse intent on enjoying a chicken dinner. But maybe a duck will do? Clever duck manages to avoid the cookpot by declaring, “You are mistaken, sir. I am NOT a DUCK!” and adopting a variety of classic doggy behaviors such as wagging her tail and peeing on the carpet. Finally, Fox relents and takes the “dog” back to the farm where she belongs, only to find a surprise in the house that blows the lid off the whole ruse. The hilarious illustrations sketched with marker and colored pencil are designed like large comic book panels and have a real slapstick appeal that is perfectly suited to the comedic text. Kids will love being in on the joke, and the large word bubbles make reading easy even for beginners. Don’t be outfoxed. Get quacking and buy this book. of the fox (“You are mistaken, sir. I am NOT a DUCK!”) also adds to the humor. primary grade readers and the comic-like format may appeal to reluctant readers. Preschool, Primary Wiseman/Simon 0 pp.